Great Book! But the last one is very sad. An absolutely amazing book series and movie series! I read all of these! I read all of these last year! They ROCKED!!!! Well I read almost all of them, I still haven't been able to read the last one. I started this when I was in high school, the book store near me stopped carrying them. I just recently started picking them up again, they are so good! The TV show follows these books to an extent but not really true to the books. I have read these books for years the natural remedies are great for damaged horses. I have an abused horse and I have used t-touch and some of the remedies in the books. Some of the techniques they use are true and can be used. The TV show is great too. Although, they do not follow the books in order it is still a very good book series. I'm only on #11 so I have some ways to go to finish the books. I love watching Heartland so I thought it would be a good idea to get the books. I was reading all the reviews and it sounded so good so I was looking on amazon and I fond out that you have to get the books used. That is so unfair so now I cant get them. I will just have to get them from the library. So i was wondering if anyone knows where I can get the books for a good price new or not in bad shape. If you do then talk to me on Kogama. My name on it is Monkgirl567. I am so sorry to hear your mom Amy I really do. You do know that so much to your mom. So good! I love this series! I just got my bff into it, she took half of my books(all of which were heartland)! If you like this series check out Canterwood Crest! I read this series a LONG time ago and I'm thinking of re-reading them!! They're just that good!!! Plus, I LOVE all the horse knowledge it has. AMAZING!!!!!!! heartland is so cool, i think all the horses are very nice ty and amy are so cute together the love birds. i think heartland need more movies and need more horses. Heartland is a great book not for younger readers. It is very sad. book 15 is the best book of yours! i love this series! since i love books about natril horsemanship i love amy and Ty. my BFF and i even are considering a book club for heartland. LOVE this series. Heartland is amazing. I was almost crying when Amy found out her mom died :(. Great as the books are, the tv series is ever better! Although some things are changed in the tv show (there is the addition of Malerie and Caleb - awesome additions - and Ty's past is completely different. The last names of some main characters are changed, like Ty and Ashley) the series is AMAZING!!!!!!!! Amber you are TOTALLY AWESOME! I have 4 horses of my own and I LOVE them to bits. I really LOVE western riding & my horse Bubbles really LOVES cow work. the books, in our library at school we have the Heartland book series, so I read as many as I can! I LOVE these books! (: They're about a girl named Amy who heals horses. She has a gift with them. Her mother died in a car accident and she wound up in the hospital for weeks while her family had the funeral. The accident happened when Amy and her mom were on their way back with a horse they had just rescued. It was dark and stormy and they were on an old mountain road. So, coming down it, a tree fell on the truck. This is a wonderful series that became a Canadian TV show about a girl who heals her own heart while healing the horses. <3 Luved Them <3 !!!!!! I love the heartland books, i'm looking for book 9 and 10. do you guys know where i can read them? The series are great, but near the end it isn't as good. I luv the Heartland books. I just started book one 2 days ago and finished it the same day! I read book 6 too. the tv series is awesome and Ty is so handsome! It's about a girl named Amy Fleming whose mom dies in a car accident trying to save a stolen and abandoned horse. (I almost cried when Amy woke up on the hospital and found out her mom was dead.) I won't ruin it but it is awesome!! I love you're show I wish you could make a 5678 series. I would watch a whole CD of Heartland in 1 day. I have comments for all of you. Amy you're pretty and an amazing person I would die to see you in real person and Ty you're very handsome and makes good choices. And Lou you're beautiful and Lucky. And Jack you're funny in the episodes. Malerie is very funny too, plus pretty. P.s. Jakes way more you're type. Tim is handsome as well and you're just like my Dad. Scott is amazing because I could never stand looking at blood and I would pass out if I had to give a horse a needle, no kidding. And Saraya is pretty and awesome. And Caleb is funny and handsome. And Ashley is pretty and it must be cozy to live in a trailer. Last but not the least Val you're funny and sometimes offensive to Caleb and Ashley but you're just fooling around. OH and I almost forgot Lisa you're beautiful too. WELL BYE! I'm counting on you guys! Good acting. Heartland is great!! I love the books and the tv series!!! lauren brooke is AMAZING!!!!!!!!!!! i just loved all the books. I'm their biggest fan! Heartland is about a 16 year old girl who heals horses who are emotionally or phisically damaged, then once the horses are healed, she finds them loving, caring homes. I think the Heartland series is a very inspirational series, and the best part is that you can totally relate to Amy Flemming. It makes you want to learn more about horses and how you can help them! Heartland is the best book series ever! It is about a 16 year old girl who has a gift with horses. Be sure to check it out! Heartland also has a DVD series by the books by Lauren Brooke. It is about a girl named Amy Fleming who's mother(Marion Fleming)dies in a car crash when they were rescuing a horse, Spartan. That's how it starts (I'm not going to tell you the rest otherwise I'll spoil it!! !-it also now has a season 3 coming out!). Basically me and my sis went to the library and we saw the books 'Heartland' by Lauren Brooke we obviously read them-they're really good you should read them!-we then read in a magazine that Heartland was coming out so we begged our parents to get the DVD and we did and... it's brilliant as well as the books!!! You can also watch bits on YouTube!! I love this series sooooooooo much my favourite is no. 7 'Out of the Darkness' I nearly found myself crying reading i lent it to my friend who doesn't really like horses that much and she LOVED it! I'd recommend it to anyone. the tv show rocks too! i watched the t.v show and it rocks. Heart land is a great series of books for anyone to read. Its where Amy, her grandfather, Jack Barlett and her sister Lou help horses and one of the most important people in the books called Ty Baldwin who later in the series becomes Amy's boyfriend, he is also her best friend. They both work together to help damaged horses who have been abused etc. This series of books is life changing and it could help you too in some way. Heartland is a series (season 1, season 2, season 3, and i think there is a season 4 too!). Me and my sis started reading the books which we found in the library and then we discovered that it was now out on DVD. We really wanted to get it as it's got 4 discs and the books are really good so the DVD surely would be good as well! We then went camping in the summer holidays and our dad brought his laptop (bit strange) and guess what he was watching a film...Heartland. So that's my story! I really recommend it. It's awesome!!! I am an ultimate horse lover. When i got the last book of the Heartland series for christmas. I started reading it non-stop every day! I found myself inside the story and i could always make a connection. i finished the book in a flash and had to to the library to get the first book. it took almost a year to finish that whole series. Including the special editions. When i was finished i almost found myself crying because i knew that there were no more books left in the Heartland series left to read. Heartland is a horse farm nestled in the hills of Virginia, but its much more than that. Heartland is a place like no other - a place where the scars of the past can be healed, a place where frightened and abused horses learn to trust again. Heartland is the best, there is the TV show and the books and I say u should see both! I have only read one of the books and it is different the TV show so new stuff is always happening. Heartland is a great series of books. I would recommend it to girls 11 years old and up who love horses. THIS BOOK IS THE BEST AND I HOPE YOU ENJOY IT. I adore heartland, it is just the best, I would really recommend you read all the books they are so cool!!!!!! 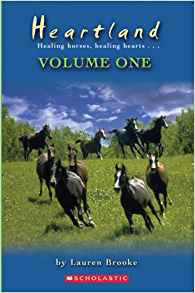 The heartland series is a great book for people who love horses. It is my favorite book series! It is about a girl named Amy who's mother dies in a car crash while trying to save a horse and afterward she has to heal horses and rely on what her mother taught her. But you should only read it if you are ok with reading sad books because it is kinda sad (I cried) just so you know. But over all great book. Good for any horse crazy girl. This series is quite good, though Amy keeps changing her mind (making it seem like the author doesn't know what she's doing). It's good nevertheless. Horses, Romance, Friendship, Trust, Tragedy, & betrayal..
Heartland is a horse ranch in which Amy Fleming helps heal damaged and abused horses while coping with all the twists and turns of her own life. She never turns a horse down. Heartland is a horse farm nestled in the hills of Virginia but its more than that. It is a place like no other, a place were the scars of the past can be healed, a place were frightened and abused horses learn to trust again. Mercury was once a talented jumper but since he got rapped he won't jump he even refuses trotting poles. improve, she and Ty end up disagreeing with each other and she leaves. Get the book to read on! Amy and her mom go to this mans farm to rescue a injured show jumping horse. That night there was a storm and the horse was frightened. Amy's mom swerved off the road and down a hill and hit a tree...Amy's older sister, Lou, leaves her job to come to Heartland to help, and Amy begins to cope with the new circumstances of her life, relying on her work with her beloved horses to help her face the future without her mom. Well, Amy, Lou and their grandfather Jack live on a farm. Amy's mom, Marion Fleming, owns a farm where rescued, abandoned and neglected horses go. But when Marion dies, what will happen to the farm?? Read the series with the 24 books that Lauren Brookes wrote!! The hearltland books are really good, I recommend them to all. They really get you hooked, bring a tear to your eye, and make you jump with joy. These are some of the best books I have read!! My favorite horse books are the heatland series written by Lauren Brooke. There are 20 in the series and some special editons. They are about a girl who gets abused horses back to their normal selves, by using natural methods. She goes through some tough times, but ends up making it through them. heartland are the best horsy books and if you love horses youd e mad not yo read them!!! me and my sister love them and many people in my class at school love them!!! WHAT ARE YOU WAITING FOR? READ THEM!!!!!!!!! I really like the Heartland series!It is very exciting but realistic (unlike a lot of horse novels!) Just like jumpoverit said, Amy's mother dies when they go to get an abandoned horse during a storm. I would say that these books ars by far the best horse stories I have ever read. I was dissapointed to find out that there are only six books in the series!The ONLY bad thing about this series is that it has a little too mach child-romance for my taste! It is a series about a girl (Amy) who runs a horse sanctuary for scared and abused horses after her mum dies. She uses herbal methods to treat the horses and it is such a touching series (21 books in all) THAT I cried after the last book and at all the sad bits in between. So if you're a natural horse lover I suggest you read this series, it will touch your horsey heart. I LOVE the heartland series!!!! !